I made a batch of this delicious Parmesan Pine Nut Bread for company a few weeks ago and it turned out spectacular. 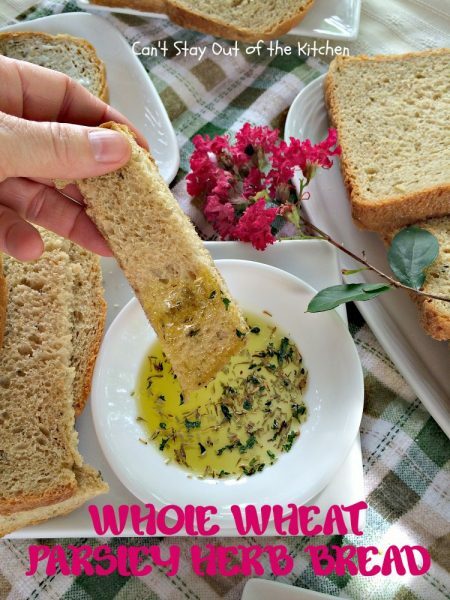 I really enjoy Greek or Italian-type breads anyway, but this great recipe includes Parmesan cheese, pine nuts and Italian seasoning which provides really nice flavors and depth to the bread. 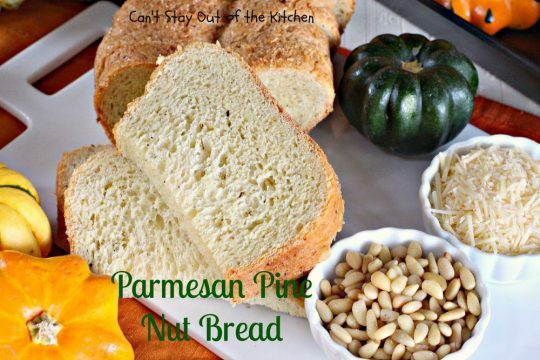 Parmesan Pine Nut Bread is wonderful served with an Italian-type meal, although I served it with Chicken Parmesan Casserole, several different Tomato Tarts, and Pumpkin Nachos! 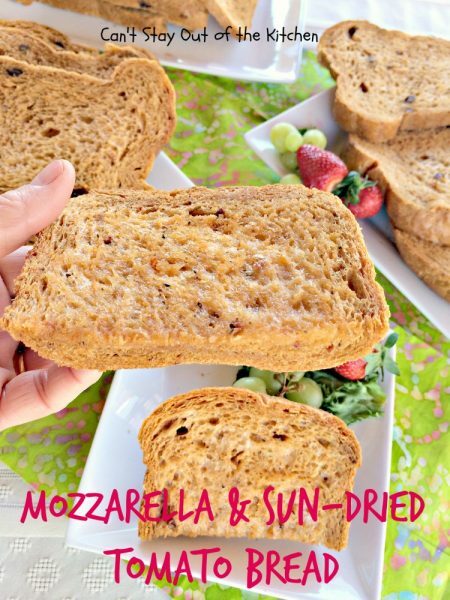 The crunchiness from the nuts and the savory flavors from the cheese make for an excellent tasting bread. I found this recipe in my Better Homes and Gardens, The Complete Guide to Bread Machine Baking. I’ve made about ten recipes out of this book so far, and everyone has come out fantastic! Not only that, but I picked up a copy of the book at Half Price Books so it wasn’t overly expensive either! This is one of the few bread machine cookbooks that hasn’t let me down with disasters at every turn! Parmesan Pine Nut Bread is a wonderful and tasty homemade bread you’re family is sure to enjoy, too. If you’re looking for a great tasting bread but you’re tired of plain white bread, then why don’t you give this one a go? You won’t be disappointed. My ingredients listing is for a two-pound breadmaker, although the original recipe gives an ingredient list for a one-and-a-half pound bread loaf as well. 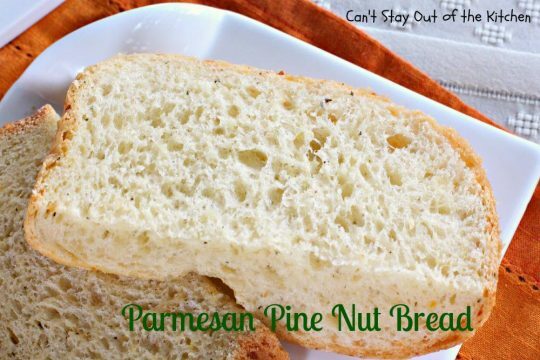 Parmesan Pine Nut Bread is a great bread to throw in the breadmaker now that the days are getting cooler. Add a pot of soup, chowder, stew, or chili and you’re good to go! Parmesan Pine Nut Bread is a wonderful, savory bread for dinner time meals. This bread also made a great sandwich bread. I made several grilled sandwiches with it. 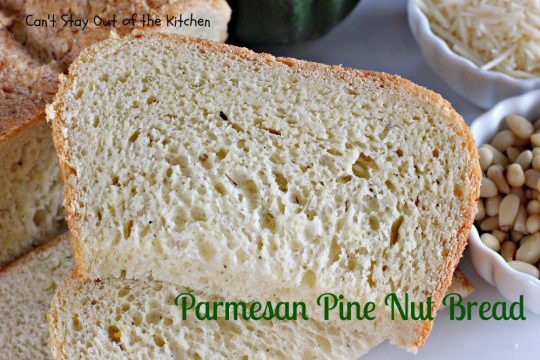 Parmesan Pine Nut Bread is a great bread to serve with Italian dinners like Baked Manicotti, Baked Ravioli, or Tortellini Spinach Casserole. 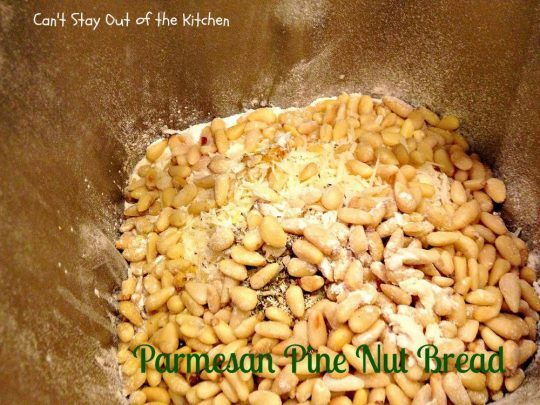 I love nutty breads but I’ve never made one with pine nuts before. This one was terrific! The recipe calls for either Parmesan or Asiago cheese. I actually had both on hand but chose to use Parmesan cheese. Pour milk into bread canister. Add an egg, olive oil and bread flour — NOT all-purpose flour. Bread flour has a lot more gluten which helps all the bread molecules adhere and stick together better which prevents the loaf from getting crumbly or dried out. Add Parmesan cheese. You can use Asiago cheese if you prefer. Add Italian seasoning, salt and honey. You can also use sugar if you prefer. Add bread machine yeast and pine nuts. Place bread machine on setting for regular white bread and bake until done. My breadmaker bakes white bread loaves in three hours fifty minutes. Allow bread to cool about 15 minutes. 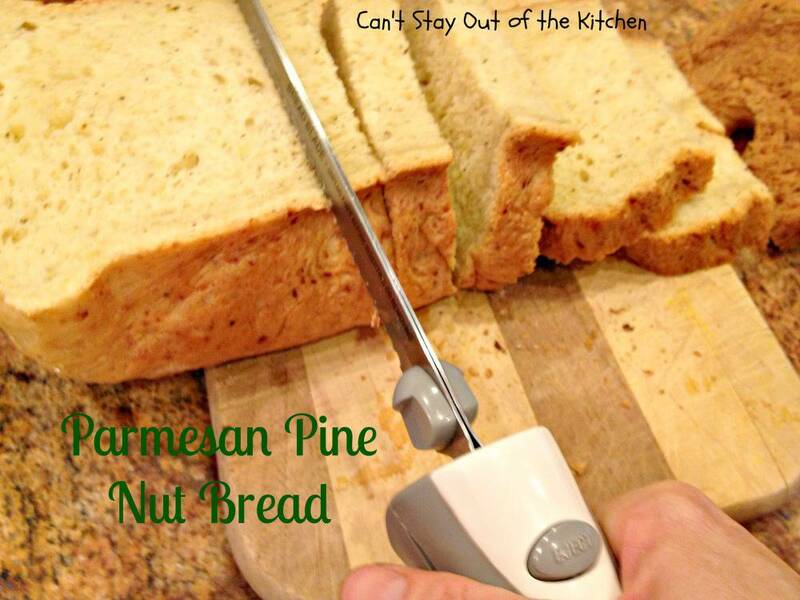 Remove from canister and butter tops and sides of bread to prevent crust from hardening. 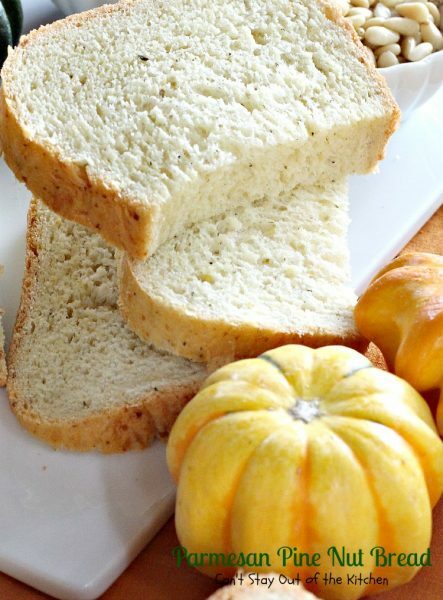 Allow bread to cool 15 minutes longer and then slice down. 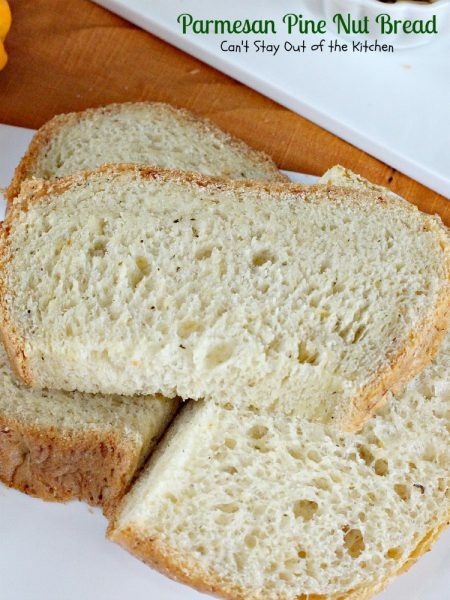 An electric knife gives really clean, crisp cuts to the bread, whereas a regular serrated knife may make the bread look like you were hacking off pieces! Here all the bread has been sliced down. This two-pound loaf provided about 20 slices of fresh homemade bread. Here’s a close up of Parmesan Pine Nut Bread so you can see the texture of the loaf. 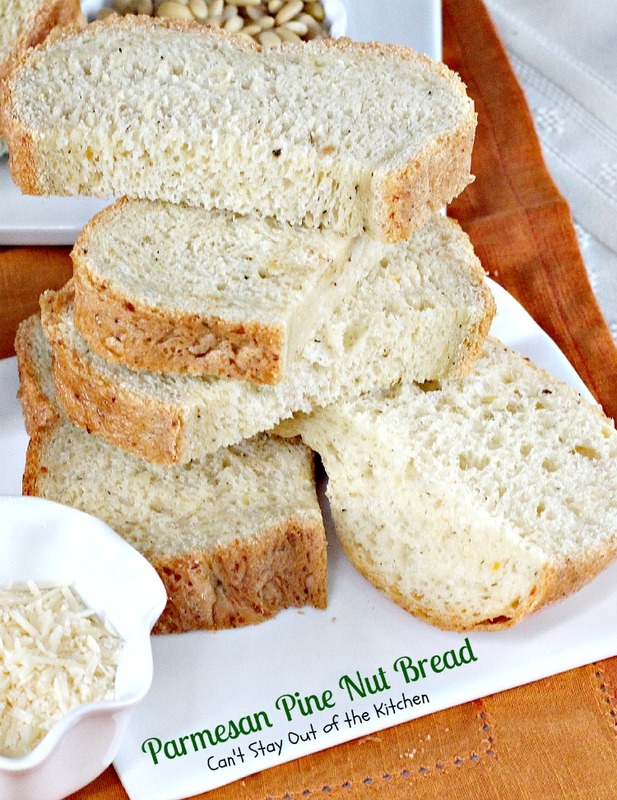 Parmesan Pine Nut Bread is a fabulous homemade bread your whole family is sure to enjoy. This bread is great served as an accompaniment to soups and chowders. 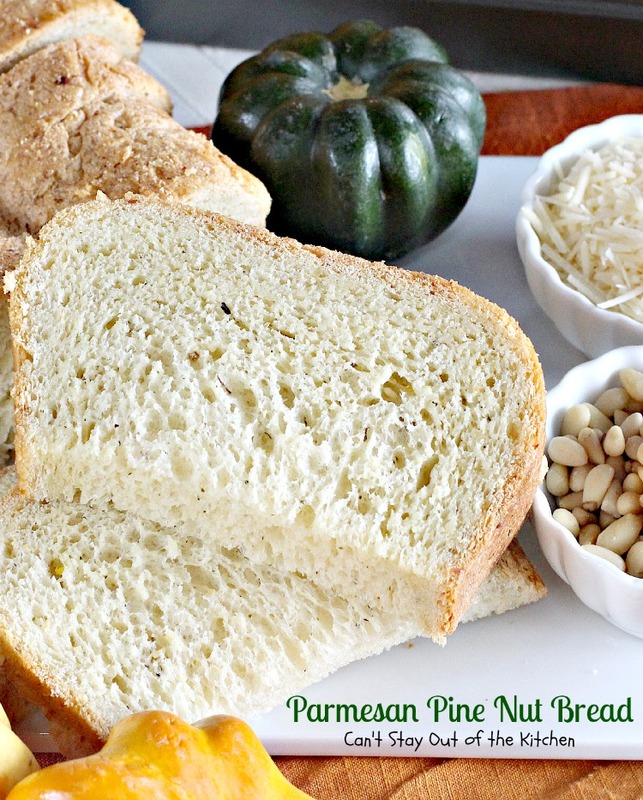 Parmesan Pine Nut Bread is also a great bread to serve with salads. This bread is so tasty. We loved the savory richness of this bread. 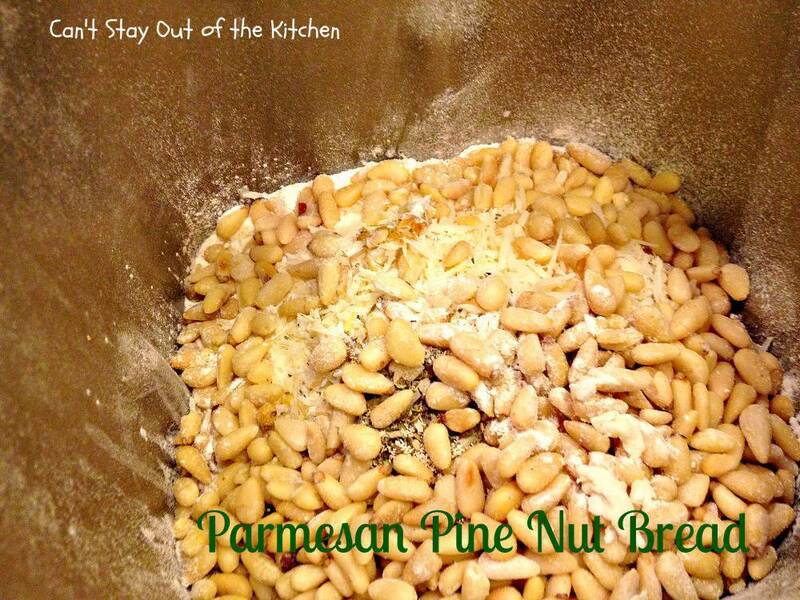 I enjoyed the crunchy, nuttiness from the pine nuts. Treat your family to a loaf of this delicious dinner bread the net time you make up a pot of chili or stew. 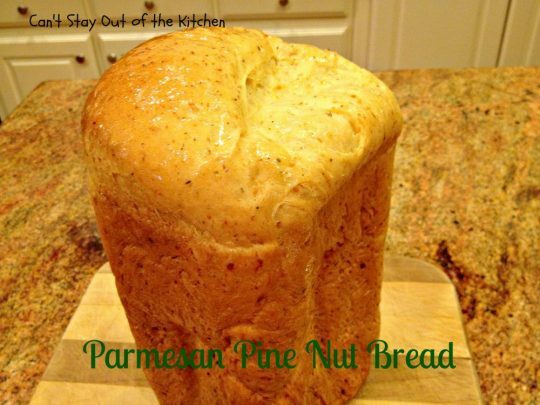 Delicious homemade bread loaf for the breadmaker using Parmesan cheese, pine nuts, and Italian seasoning. This recipe is for a two-pound bread loaf. Layer ingredients in bread machine canister in order given. Bake on regular white bread setting for a 2-lb. loaf. My breadmaker takes 3 hours 50 minutes. Allow bread to sit about 15 minutes before removing from oven. Butter tops and sides to prevent the crusts from hardening. Allow bread to cool an additional 15 minutes before slicing down. 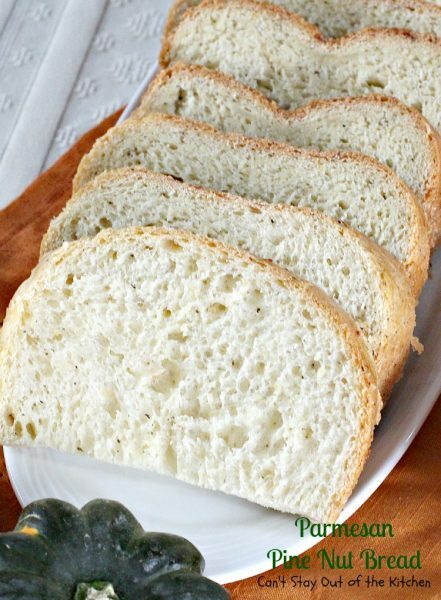 NOTE: Because homemade bread has no preservatives, you will need to refrigerate it after a couple of days to protect it from mold. It takes all of five minutes to throw all the ingredients into a breadmaker and out pops this tasty loaf of bread! 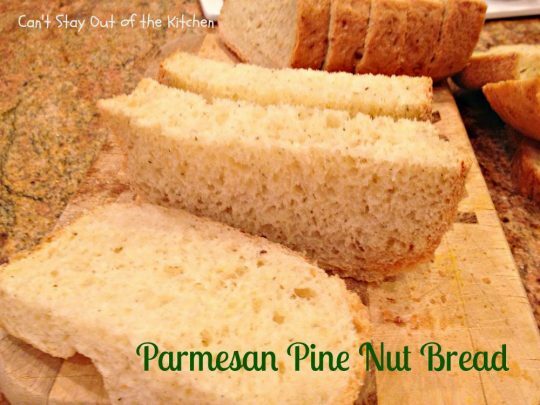 Parmesan Pine Nut Bread is great spread with garlic butter, but you can also dip it in olive oil with spices and black pepper. Here’s another close up so you can see the texture of the bread. You can see the flecks of Italian seasoning in the grooves. 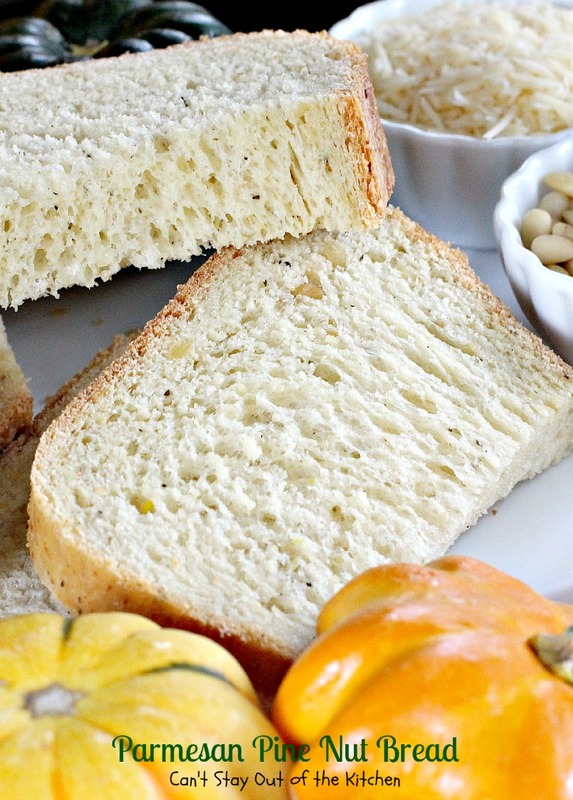 Try making a loaf of this amazing homemade bread the next time you have company over for dinner. Everyone will want second and third slices! This bread sounds terrific. My problem is I do not have a bread machine. 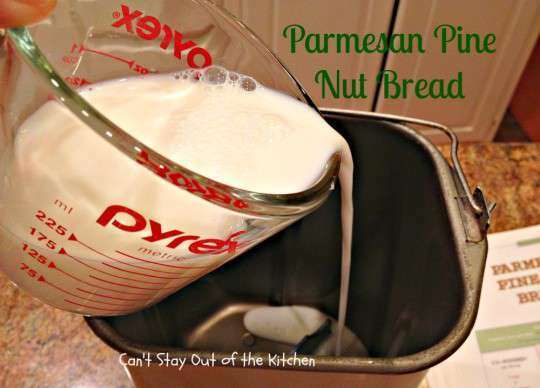 How can I make this with my stand mixer and a loaf pan in my oven? Hey, Lisa. You will have to start with a regular bread recipe and add the ingredients for this recipe in the same pattern found on one of those recipes. 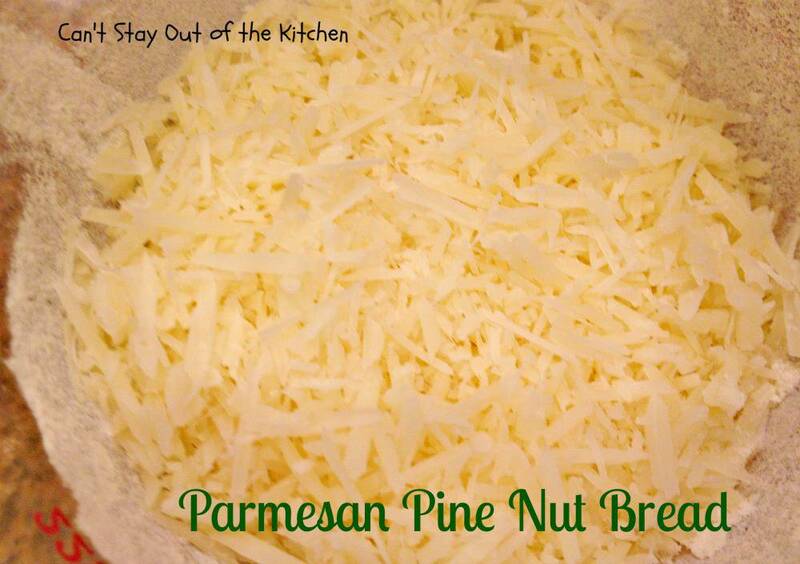 (Stir the cheese and pine nuts in before adding the flour). For one loaf of bread you will probably need one whole packet of rapid rise yeast. I would start with mixing about 2-3 cups of the flour and then work the remaining flour into the dough as you knead it. You may end up using more flour this way. I hope it turns out for you. You may have to improvise a little. It looks like a beautiful and delicious loaf of bread. Bookmarked! Thanks, Pam, it really was a delicious loaf of bread! I hope you’re able to make it sometime. Thanks for stopping by.